Besides all of the controversy, what caught my eye was that it was Michael Ruhlman. Not only do I occasionally read his blog Michael Ruhlman but I have read most of his non-fiction books about his experiences at the CIA. Having contemplated going into the culinary arts myself, I love reading about it. At this convention he called on America to cook more. Or more bluntly that Americans were lazy when they confessed to be too busy to cook. Basically he stated that everything is a choice. If you have a job that makes you be in an office 80 hours a week or a two hour commute it is your choice. Just like you choose to get take out instead of make your own supper. I completely agree. I also am known for eating out at least once a week. My dining out is two fold sometimes I eat out because it is fast and easy for what is going on at that point in my life. Other times I eat out because it is a cool new restaurant I heard of or it has some yummy dish I like. Jordan recently bought a one month pass for a driving range allowing him to hit as many buckets of balls for 30 days at one low price. And hit he has. Determined to get the most bang for his buck everyday after work he drops me off at the gym and goes to hit his balls. Now, I am really lucky because up until this month the norm was for me to go to the gym after work and Jordan to go to the apartment. By the time I get back from my work out dinner is cooked and on the table. Normally we are dining by 6:45ish. Pretty sweet deal huh? The golf has gotten in the way of my sweet deal. Now Jordan picks me up from the gym (its on the way to and from the golf place) at 6:45. We get to the apartment by 7 and start dinner together. We eat at 7:30pm, if I pre-cut and prepped the meal in the morning. By the time dishes are done and I am all cleaned up for the night it is after 8pm and I am exhausted. This is probably more of the natural course for most couples nowadays and by that I mean eating late. For me, though 8pm means night and winding down. I am a morning person through and through. The point of all of this though is we have done this for two weeks now and although not the preference it is our choice. Things got more hectic and we still cook. I think some people do have a predisposed taking to cooking. You have the natural knack for it and thus enjoy the whole process that much more. I come from a family of cooks so I am convinced it is in the blood. I see how some people may not enjoy this but I think to blame time as the main reason for not cooking is pretty lame. It's Sunday. I enjoy Sundays for the most part but at times they can seem hectic. I always want to finish up any remaining chores and errands before the week starts. Plus you have to get over the fact that the week is starting again. It is always the dark cloud awaiting for another work week, especially after a good weekend. I proudly state that I am a bit OCD. Although this weekend was very busy, it was also very homey and productive. For me it was a very good weekend. Jordan and I got so much done on Saturday you would think that Sunday would have been restful. However, we had a list to accomplish for the weekend and not everything was crossed out come Sunday morning. Thus off I went. Below is my going ons in the morning. At this point I realize my plan on pizza for lunch hinged on the fact that I was going to buy pizza dough at the grocery store. I forgot, so on to plan B. I knew I had yeast in the pantry and lots of flour to use up before the move. I also knew the yeast was pretty old and bad yeast is no good for any type of dough. What a full day and it is only noon! At this point Jordan is home from golfing and he is more than willing to be the sous chef with chopping the toppings and finishing off the pizza. 12:05pm Switch clothes from washer to dryer. Dissolve yeast in 1/2 C water at 110 degrees for 5 minutes. 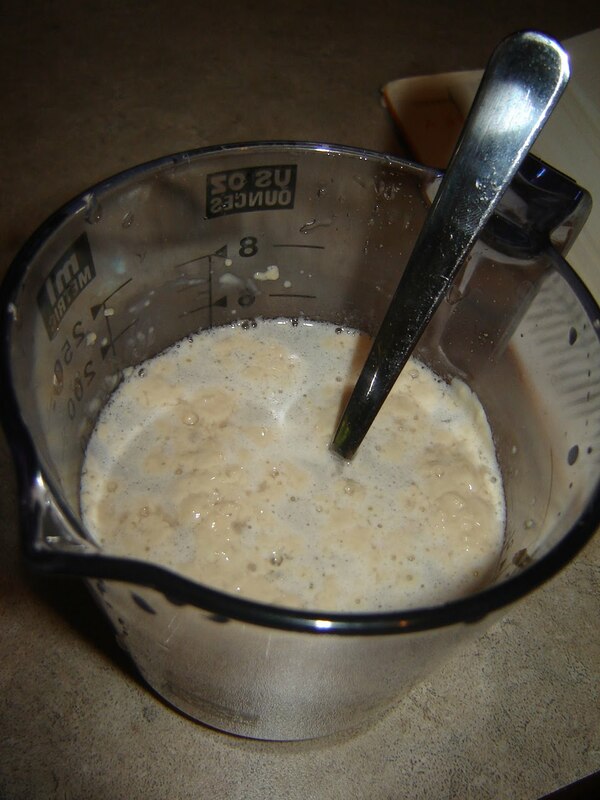 It will start to foam, which means the yeast is active. In a 2 cup measure combine olive oil and 1 1/4 c room temp water. After 5 minutes mix the two liquids together. In stand mixer with dough hook attachment combine the flour and salt. Turn on mixer to slow and pour in yeast/oil mixture. 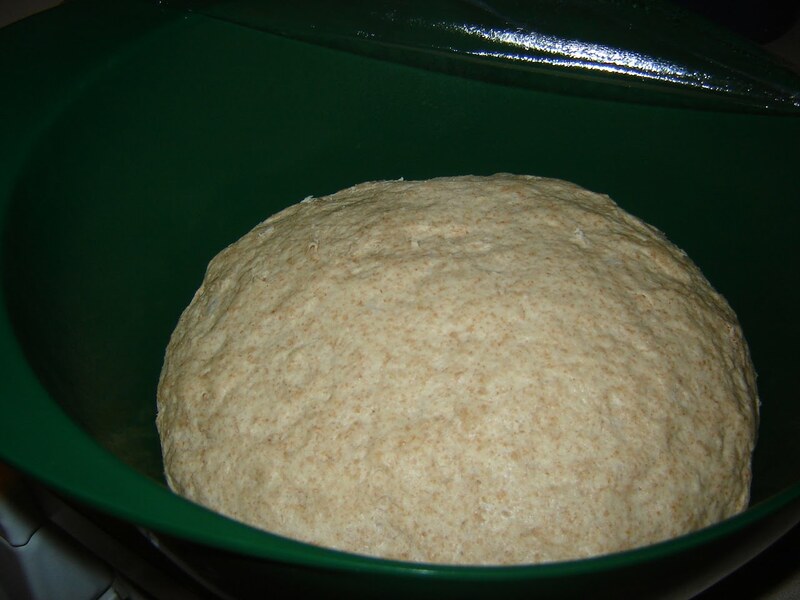 Wait till all of the water is incorporated and the dough begins to form a ball. Remove from mixer bowl and knead by hand a few turns making the dough into a ball shape. Put in an already prepared bowl - Deep bowl that is covered in oil. I just spread all the sides with Pam. Cover with plastic wrap and wait 1-2 hours - dough should double in size. When the dough doubles punch down a couple of times. The recipe makes 3 medium size pizzas. I use have for a pizza the size of a cookie sheet and save the other half for later in the fridge. It should last about 3 days. I bet you could freeze the leftovers as well but I have never tried this. Somewhere along the way Jordan and I discovered the perfect compromise for a large pizza to share. 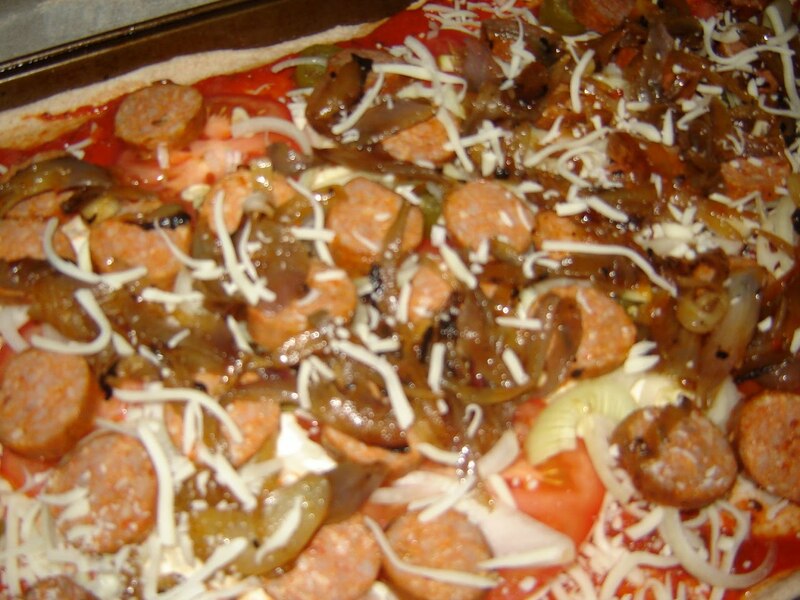 Sausage, onion, garlic, and jalapeno. It is delicious and now basically the only thing we order when getting take out. 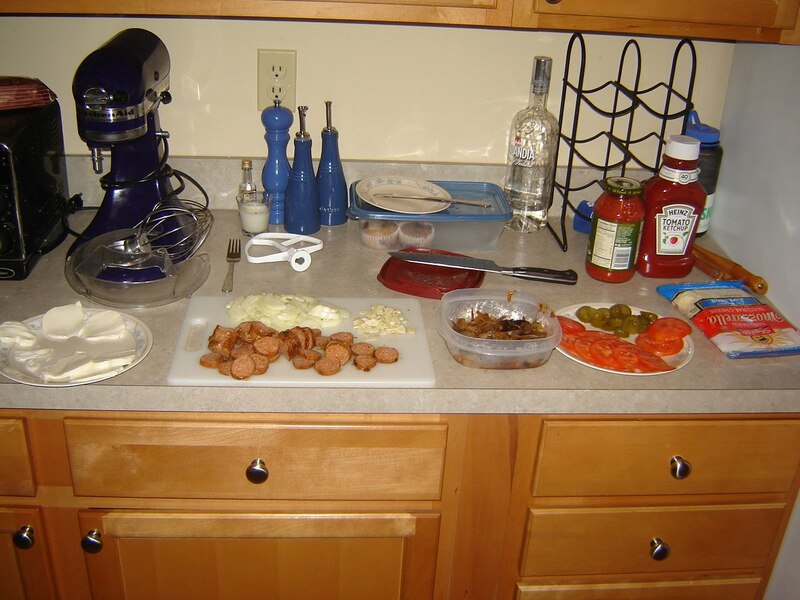 Today we happen to have all of the ingredients on hand to make at home since we had Italian sausages the other day for lunch (it was suppose to be for a big pasta dish for dinner, but weather, time, and hunger got in the way). 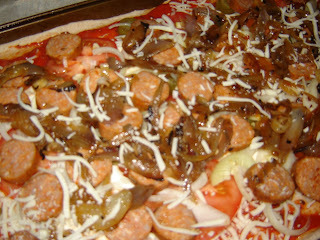 I am not going to spell out a recipe for pizza now that you have the dough. 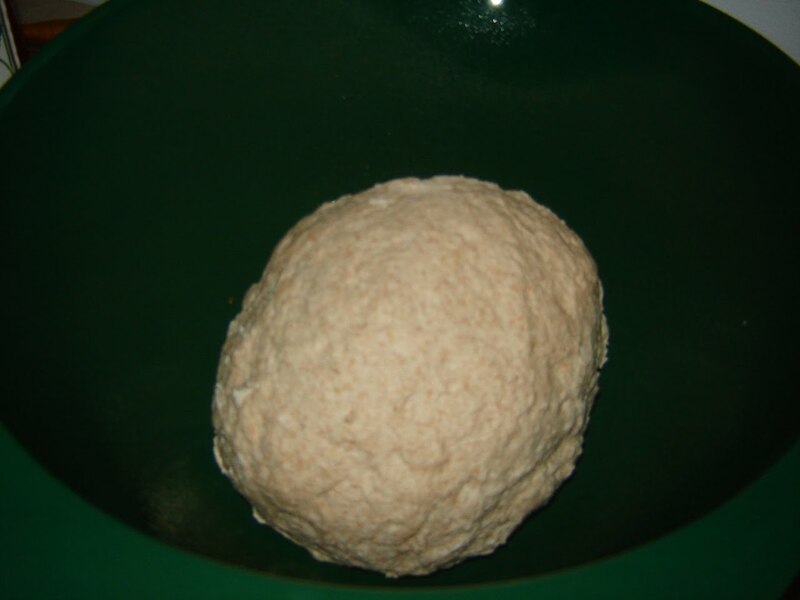 Basically you roll out the dough to desired shape. I like a thinner crust that is a bit crispy. 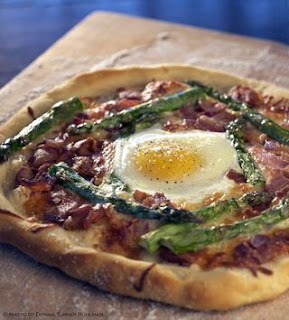 To achieve this you set the oven at a higher temperature - we go with 400 degrees and put the rack at the lowest level. 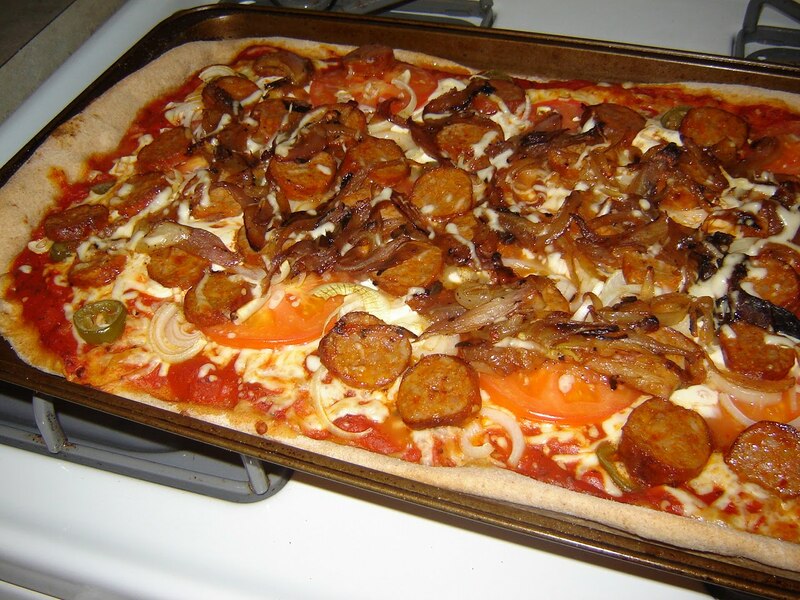 Cover pizza with sauce, cheese and toppings. 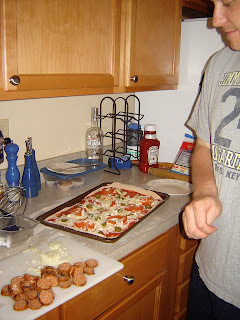 In this case we used a combination of both fresh and shredded mozzarella. We also added garlic, one sliced tomato, and then the leftovers which was store bought Italian sausage links sliced and sauted onions. 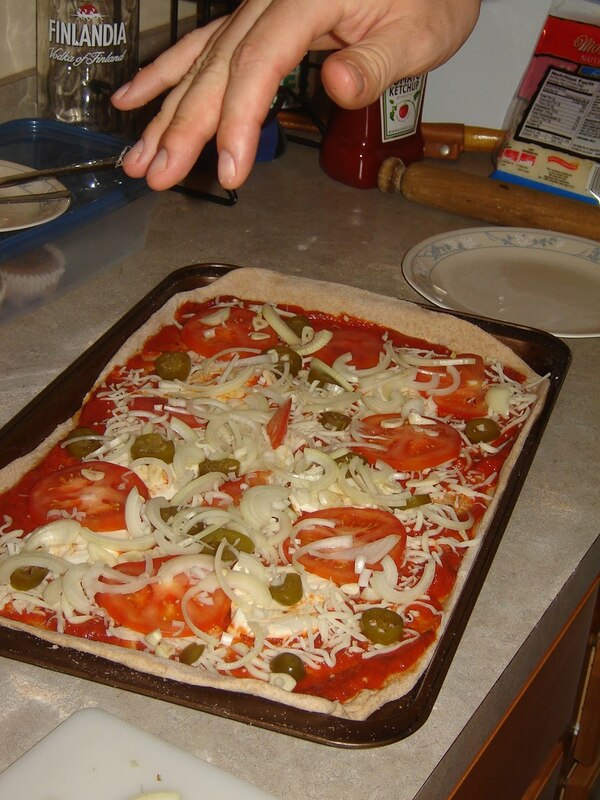 Jordan imagining his handy work of pizza making. Yummy! And just so you know at 3pm I took to watching weddng shows on the WE network and HGTV. It was a day of rest after all, at least the second half. Congratulations to me...to Jordan...to us. We finally found an apartment and have an official move out date. (it's changed a few times so this is a big deal). It was a huge relief to have this finally settled. This weekend was the first weekend in a long time we were going to be home both days. It was suppose to be the big clean, get organized, and pack weekend. Now that the date has been pushed back about two weeks the chores above were not as pressing. However, with all of the hustle and bustle of the wedding planning, apartment hunting and life in general things have gotten a bit out of control around our current living quarters. I should clarify my quarters never get too out of control. Jordan however, lives in a constant state of messiness or as he likes to call it organized chaos. I am not sure I agree with this statement as he seems to lose things often in the organized chaos but to each their own I guess. I just think he has too much stuff, way too much and he hates to clean. This weekend though with list in hand we both went at it. Doing laundry, collecting trash, and organizing papers. I thought about taking before and after pictures of the closet and desk but that would have been a bit too much. I would have been embarrassed and Jordan would have disowned me as his bride-to-be. I am joking but he probably would not have been too thrilled. For those of you who don't know I was not allowed to go into Jordan's bedroom in his parent's house for a good 3 years because of the mess inside. Now I am not sure what got into Jordan today. Normally when we have this all out cleaning days he is good for about 2 hours, maybe. However, he kept going and going today. At about 4pm I was ready for a break. I was so happy and proud of the closet. (I am kind of regretting the before and after pictures now). We both needed a break and a break we had. I think I mentioned before we are both pretty big fans of ice cream. A few days ago to be the heat we stopped by Carvel. I had a coupon for buy one, get one free sundaes and it still costs $6. I was shocked. Now, I prefer soft serve so Carvel is normally right up my alley, but not for $6. Without my coupon our ice cream adventure would have been $12. I don't care how much I like ice cream at $12 I would pass. This ice cream trip I decided as a nice treat for Jordan's hard work we would go to a local stand that feature's Jane's ice cream of Kingston. I have never had it till this trip but I have heard it featured as dessert in many yummy restaurants in the area. After checking out Jane's website and eyeing all of the flavors I knew it was a must try. Lucky for us, Beacon Creamery is about 5 minutes away. Thus, off we were on our ice cream adventure. I went with Pistachio and Dulce-de-Leche. These are two of my favorite flavors. I missed Banana Nirvana till after I order so I guess we will be going back again before the big move. Jordan went with a classic cookies and cream. He always splurges on the waffle cone, normally dipped in chocolate. Today it was chocolate and nuts plus as a bonus the bottom of the cone had more chocolate which not only delicious but provides protection against cone drippage. Needless to say it was a very productive day. The ice cream was super good. And Jordan got some golf in as well. I cannot wait for Sunday. This is the first weekend in a long time that Jordan and I will be home for the whole thing. This sounds like bunches of fun and the weather is suppose to be gorgeous. Sadly it will be spent cleaning and packing for the most part. There is a huge laundry list of things that should have been done weeks ago. Don't get me wrong though, I am sure we will have some time in there somewhere for an ice cream treat and maybe a dinner out as Jordan does not have a long attention span when it comes to cleaning. However to the point of the blog...to get the day and weekend started I thought I would whip up some muffins. Jordan really likes muffins; and we both enjoy a good breakfast now and then. So here I am with our little muffin special. Preheat oven to 350 degrees and line 12 muffin cups. In a large bowl, mix together flour, sugar, baking powder, baking soda and salt. Set aside. In another bowl blend apple sauce, yogurt, egg and vanilla thoroughly. Stir the wet mixture into the flour mixture just until combined. The batter will be very thick. Add the blueberries and stir gently. Divide the batter between the baking cups (or lined baking cups). They will be very full cups. Bake for 25 minutes, or until tester inserted into center comes out mostly clean. Cool completely on wire rack. I don't know if the warm weather is making me nostalgic over corn on the cob (nothing comes close to Iowa corn) or the fact that I want to use up as much of my baking supplies as possible before the move. Let's just say I have a lot of baking ahead of me. The last couple of days I have wanted to make corn muffins. Things have been incredibly hectic, which I made worst by involving myself in not just one but two competitive physical challenges. One is with work for walking steps. We all march around the office in our pedometers logging steps. The second is the Nike plus challenge with a few friends. This is based on running mileage. Being the fierce competitor I am, I am manic about getting time each day to add extra time to my workout routine. Needless to say this takes more time then I have and cleaning and cooking have stalled for the most part. Anyway, I have a corn muffin recipe that I use all of the time from one of Ina Garten's cookbooks. It is the perfect balance of sweet and savory. However, I needed a change this time around and found the following recipe from the Smitten Kitchen blog. 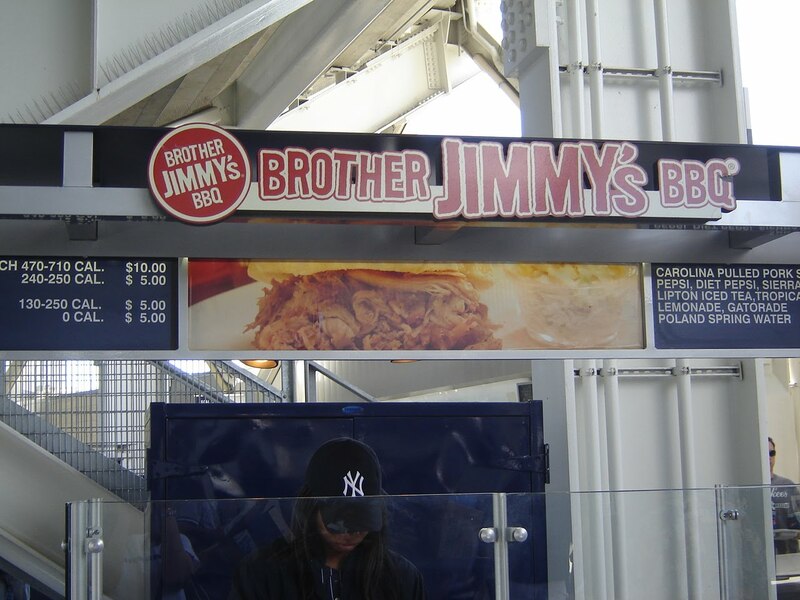 Here are some of the crazy and varied food vendors at the new Yankee's stadium. Yes, a very own Hard Rock in the stadium. 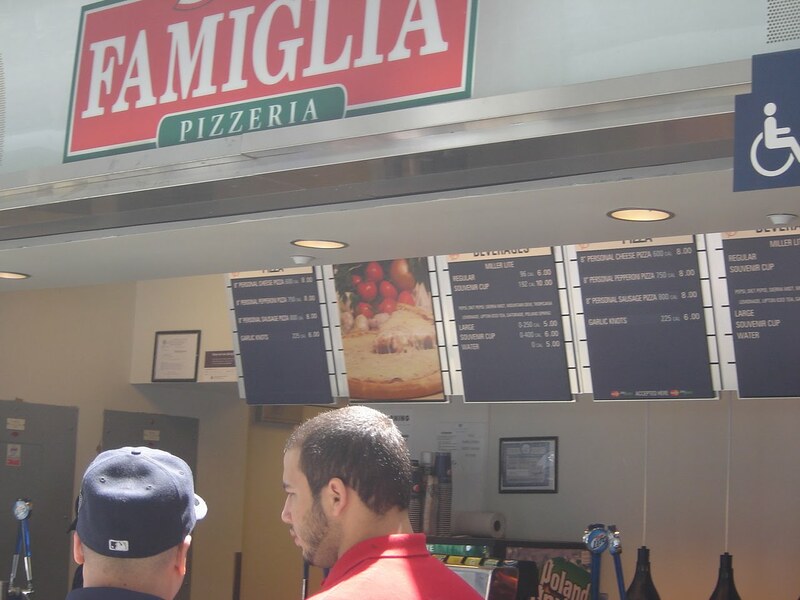 Not too long ago Manhattan passed a law that if a business, food vendor has more than so many locations in the city it must post a calorie count on the menu. 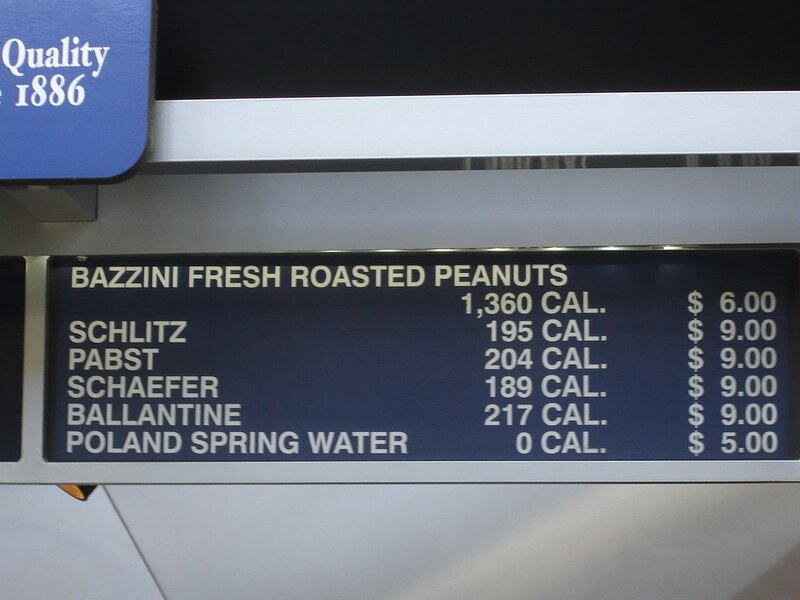 I don't know exactly how this is figured in at the stadium but all of the food areas had calorie counts on the menu. This makes it extremely difficult to order let me tell you. I try to eat fairly healthy but I am not a zealot. However, when it is right in front of you say - a 1200 calorie burger, you order something else no matter how much you want that burger. 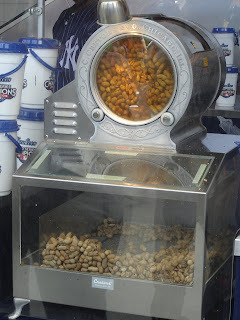 Note the bag of peanuts is 1,360 - more than the cheese fries later in the post. Water is zero calories - something they use inside the stadium as a selling point walking around trying to sell the food. Even the walking selling people have the calorie count on the price buttons. Talk about a melting pot - you have pizza and Italian options. 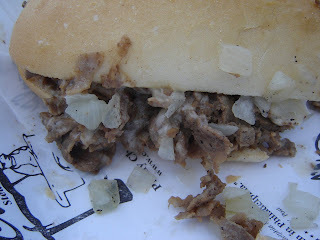 Cheesesteaks - and no they did not live up to the Philly standard. 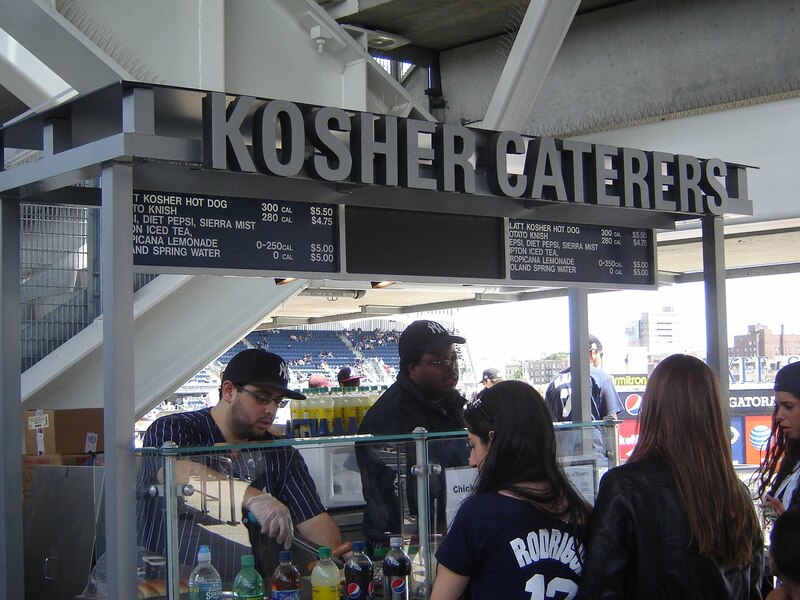 A special Kosher stand for all of the NY Jewish people. 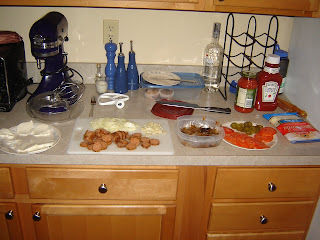 A southern BB&Q suprise complete with corn muffin fritters. And what you may ask did we dine on? Well, enough to give us both belly aches. Cheese fries only clocked in at 1,340 calories, surprisingly only 100 some calories more than the regular fries order. We saw at least 3 different types of fries - these are crinkle cut Nathan's fries. Jordan's footlong hot dog that he was oh so excited for...with all of the toppings of course. I had the cheesesteak. This was good but doomed from the beginning after living in Philly. Nothing can compare. So all said and done with drinks we spent an incredible amount of money. We think enough to have a really good dining experience at a fancy restaurant. 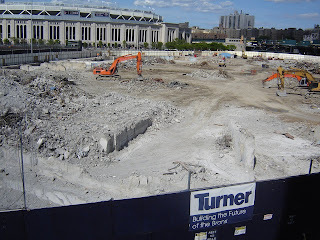 But what can I say, once in a lifetime visit to the Yankees' stadium. And it was FUN! I feel a bit like a trader. 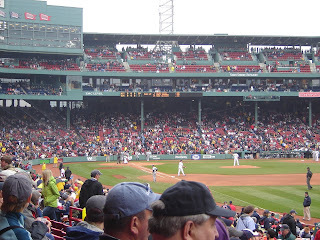 Last weekend we were enjoying the games time in Boston and Fenway. 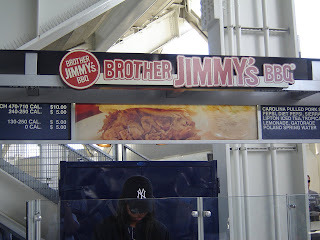 This weekend we took a jaunt to the new Yankee's stadium. For those of you who don't yet know, Jordan and I will be moving back to the Madison, CT area at the end of June. 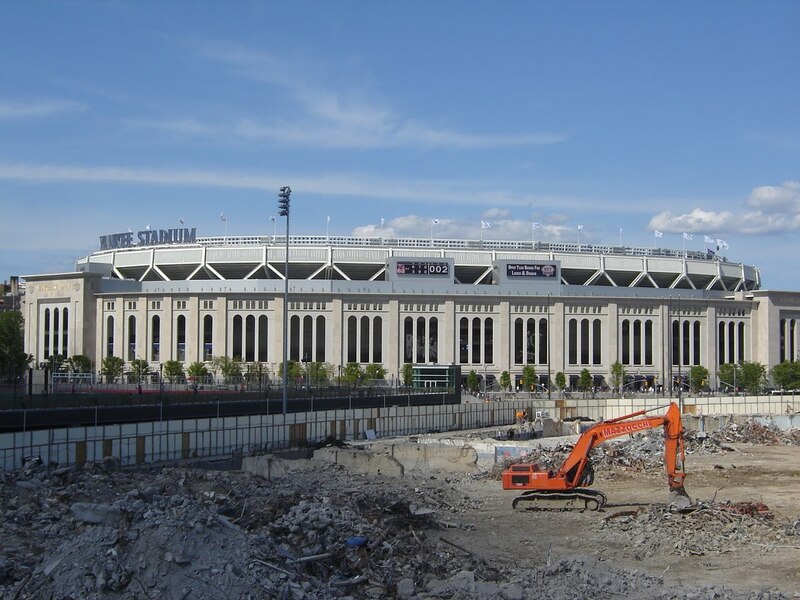 When this was finalized we decided it might be a good time to go to a Yankee's game. 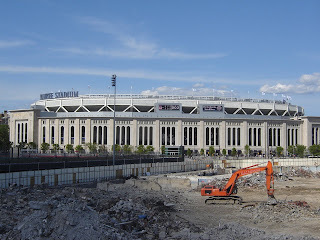 Last year the Yankee's opened the brand new stadium. We talked about going then but never got around to actually getting tickets. I guess with the threat of never being this close to NYC again we should jump on the chance to experience the new stadium. 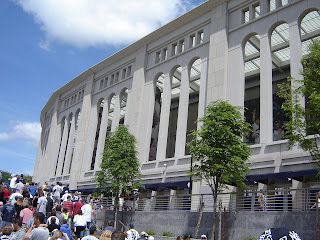 We went only to see the stadium and not for the Yankees whatsoever. 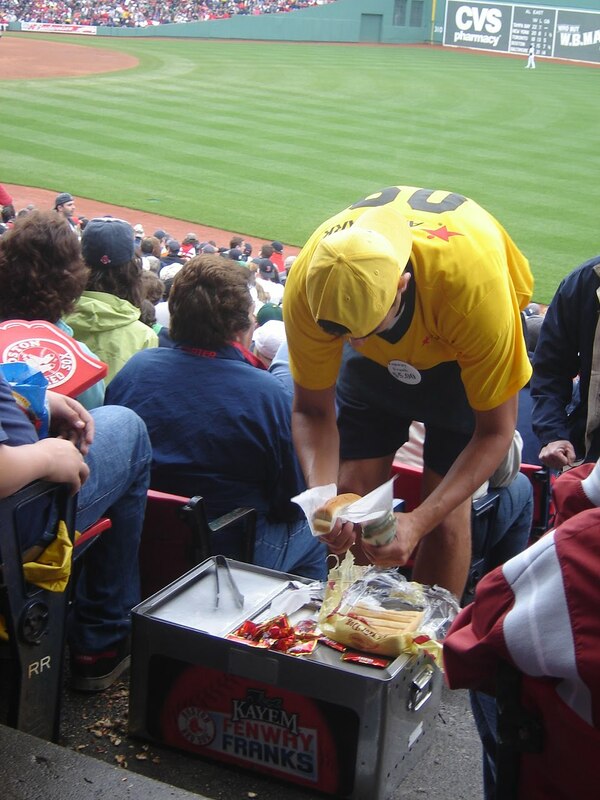 In fact we watched them play the Minnesota Twins as homage to my mid-western background. 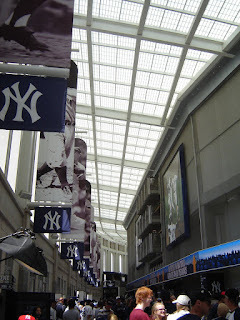 Inside the gigantic stadium. The whole thing was a bit ridiculous. Very theatrical, not like baseball at all. Inside the first, shall we call it shell, of the stadium. 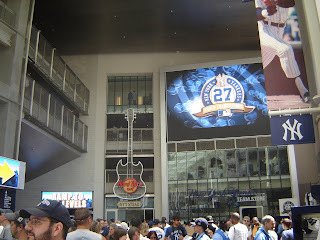 This is the ground level where a Hard Rock Cafe exists as well as many of the other crazy eats inside the stadium. Overall we had a really really good time. 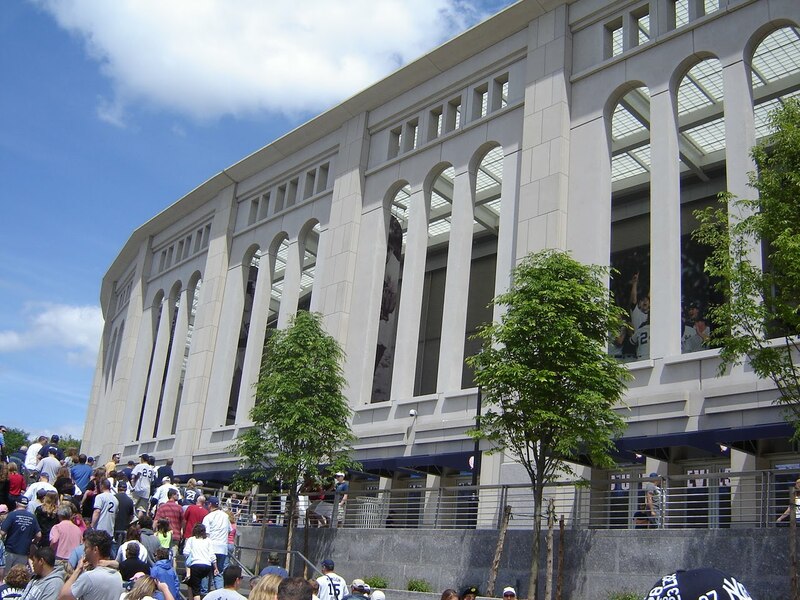 We saw a grand slam and the Yankees lost. 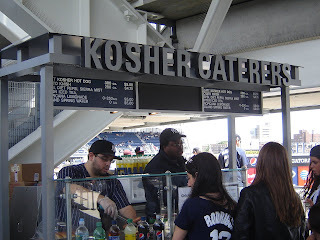 Yankees' fans really do not like to loose. They were quite grumpy after that grand slam. 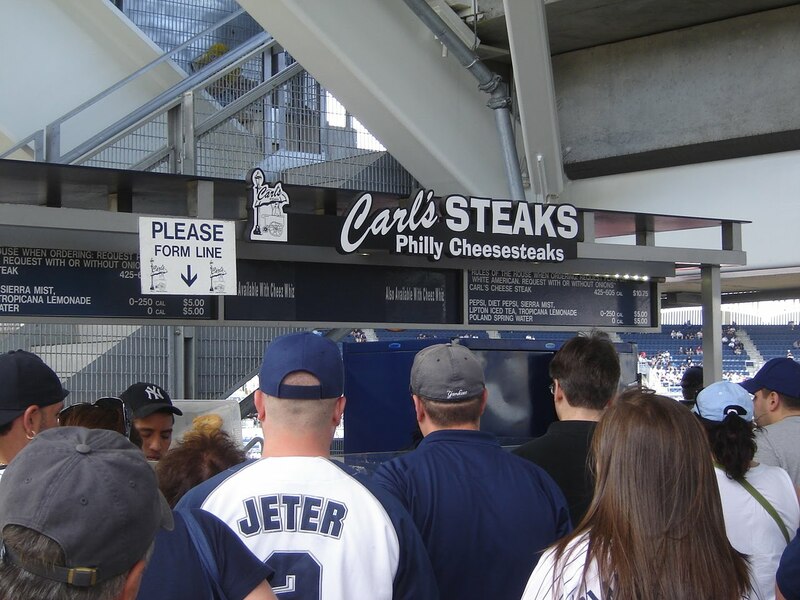 Up next, food inside the stadium. I spent last weekend in Boston. The main reason of the trip was Red Sox tickets. 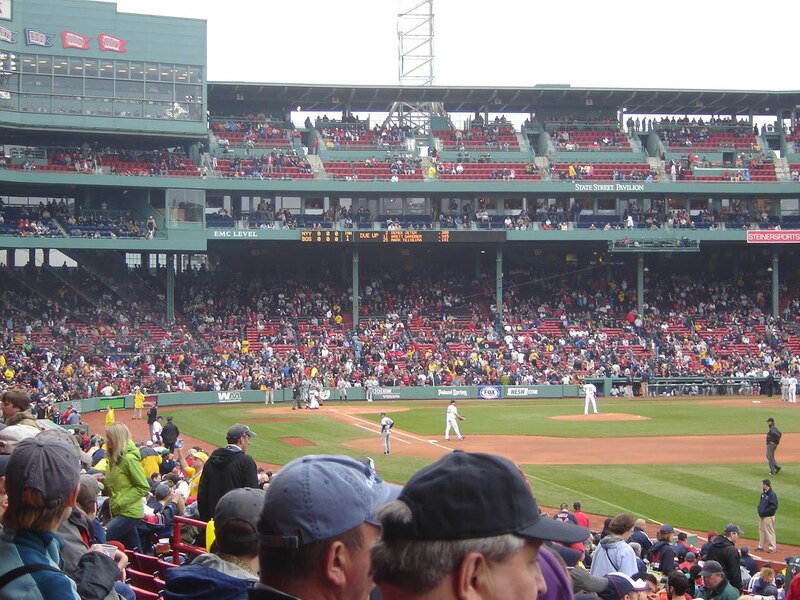 I adore going to Fenway and try to the best of my abilities to get tickets once a summer. They are nearly impossible to get a hold of it seems. 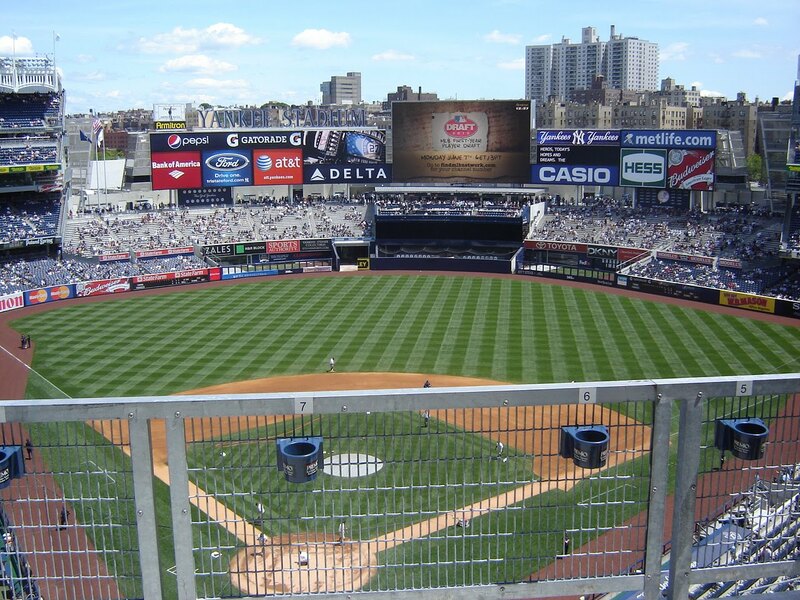 This year I used my credit card points to score two tickets to a game, and not just any game up a Red Sox vs. Yankees game. Sadly, the weather would not cooperate and this is what happened at inning 5. 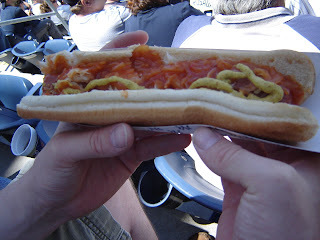 But this is a food blog, so the reason for this post is one of the best things about Fenway - the Fenway Frank! It's a hot dog. They taste so good at Fenway. The Fenway frank goes for about $5 in the park when you get it from the nice yellow shirt men that run around selling concession products. I was always fascinated by the hot dogs here as a little girl because they come on a split bun. This is something simply impossible to find outside of New England. Every summer on my trip to Maine from Iowa I would see these special buns. It took only one hard search in the grocery stores in Iowa to realize they do no exist. 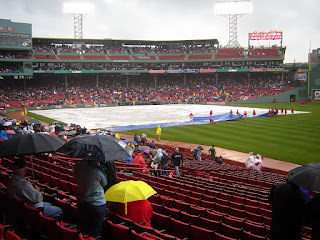 Happier times in Fenway when the game was actually taking place. Too bad the Red Sox were not at there top game. I am already counting down till next year. 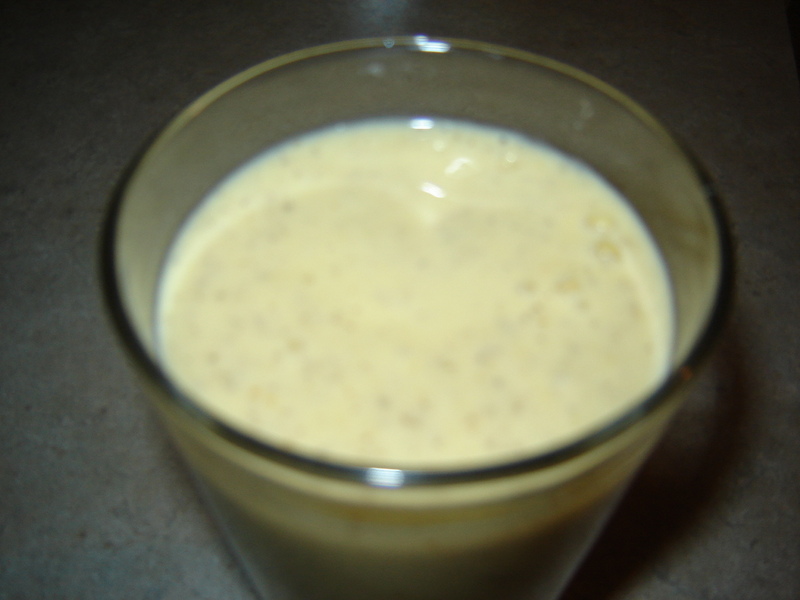 You saw in my previous post about the Mango smoothie that it had little black dots in it. Well those dots are chia seeds. Yes, this is similar to, or really the actual seeds, of those little plant pets which were so popular a few years back. Now, how do you think I came upon this? Well again my fellow co-worker informed me of theses little seeds back in the bleak winter. They are suppose to be the Superfood of all Superfoods. You typically put them in yogurt or oatmeal. They can also be added to baked goods for an added boost. I decided to try them after searching the web a bit. It was one of my wedding, get-healthy plan. I am not going to lie. I think they are a bit freaky. When set in liquidity material, IE the yogurt for about 5 minutes they get gelatin-like. This makes them perfect for smoothies. In my initial research I read that you can simply add them to water and drink. 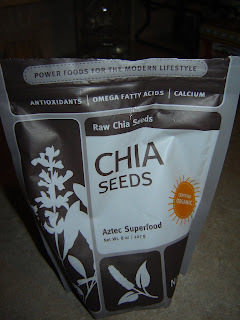 This was how I first tried the chia seeds. I would not recommend this method. First, it kind of smelled fishy. Second, the texture was just too thick for me while knowing I was just having water. All in all I try to have about a tablespoon a day, normally at breakfast time in my yogurt, cereal, or oatmeal. Whether it works or not, I cannot be sure but it does make me feel better knowing I am getting extra antioxidants everyday. The one downfall is that they are somewhat hard to find. You must go to a specialty health food store or Whole foods. To learn more about the Chia seed, just google. There are vast amounts of websites and information dedicated to the Chia seed. One of the most fun places to dine in Boston is Durgin Park. It is right by the water and the famed Quincy Market. Over the years I have dined there many times. It is a good old fashioned restaurant known for the waitresses being a bit rude. 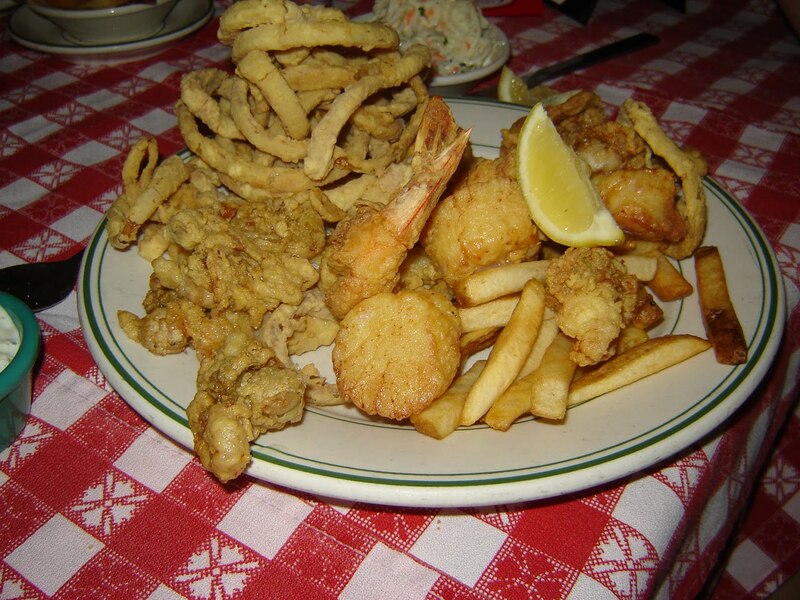 They have all sorts of New England dishes ranging from Pot Roast to the classic seafood dishes. Jordan was incredibly torn on this trip because they happened to offer a huge prime rib platter. Last time we ate here it came with a bone reminiscent of the bone in the intro for the Flintstones which flips the car over. 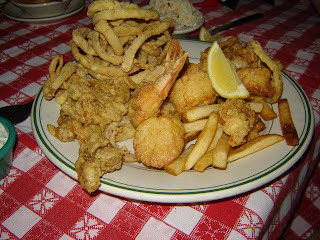 Anyway, he opted for the seafood platter which is another favorite. As you can see below they really pile it up. I was trying to be a bit more sensible with my dish. Although they have many good sandwiches, including one called Thanksgiving on a roll that was my initial choice. This day however there was a lobster roll sandwich. I love lobster so it was not that hard to switch to this dish. 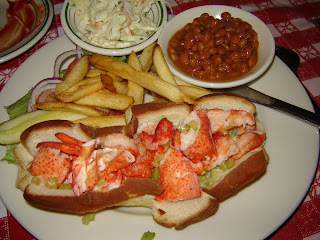 Note that the traditional lobster roll is mixed with mayo. I hate mayo and am convinced I am allergic to it. 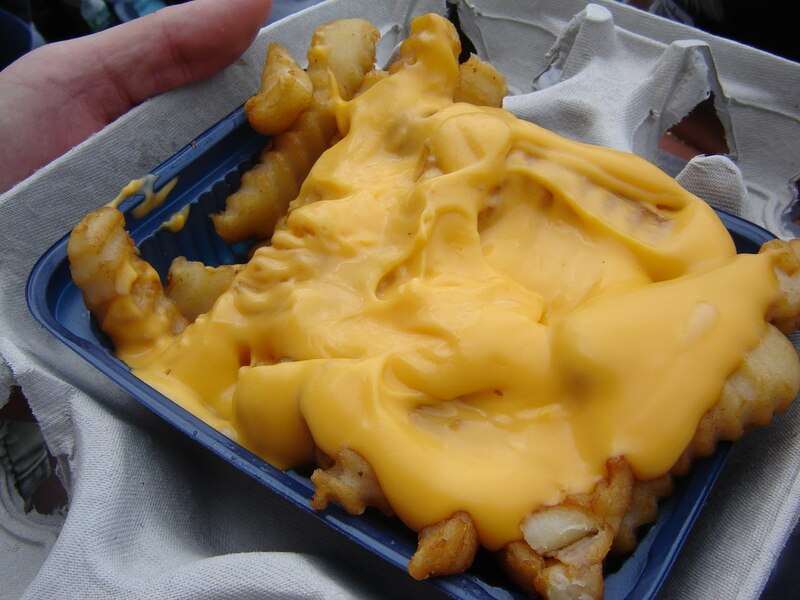 Thus the one below is without mayo. It was oh so good and made me even more excited for the wedding. 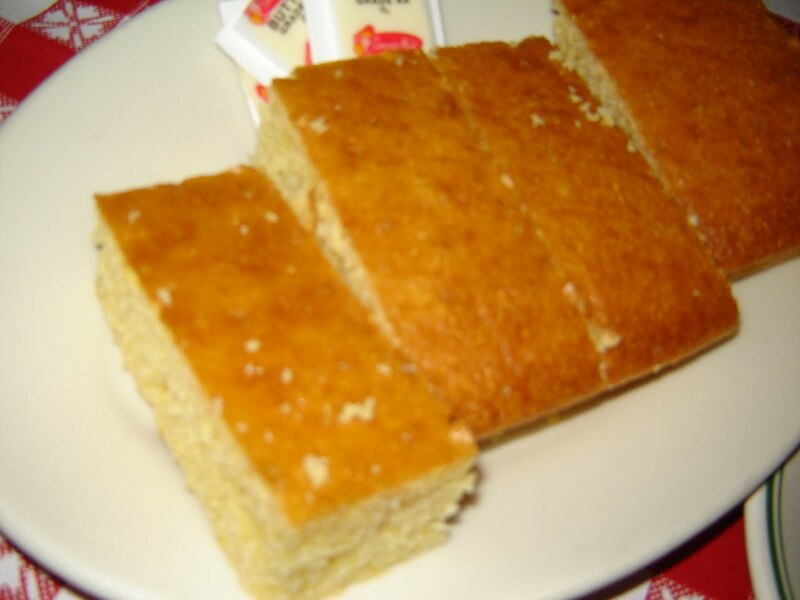 And of course you cannot go to a good New England restaurant without a plate of corn bread. I neglected to take a picture of the dessert which I shared with my mom. It was a massive bowl of Indian pudding. Another favorite from Durgin park and New England tradition. It was delicious. I promised a bit of a more colorful picture this time around. I was hoping it would be a bit more yellow and bright to help bring summer along, but this is what it is. Every so often I get in the mood for Indian food. Lately it has been more and more often. 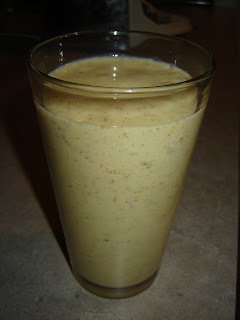 One special treat with Indian cuisine is a Mango Lasse - soy, mango, yogurt. I am not sure exactly what the official ingredients are but its good. I highly recommend it next time you dine Indian style. This smoothie is similar although not as sweet. It is pretty easy to make at home and thanks to the marvels of modern grocery frozen mango is the key ingredient. 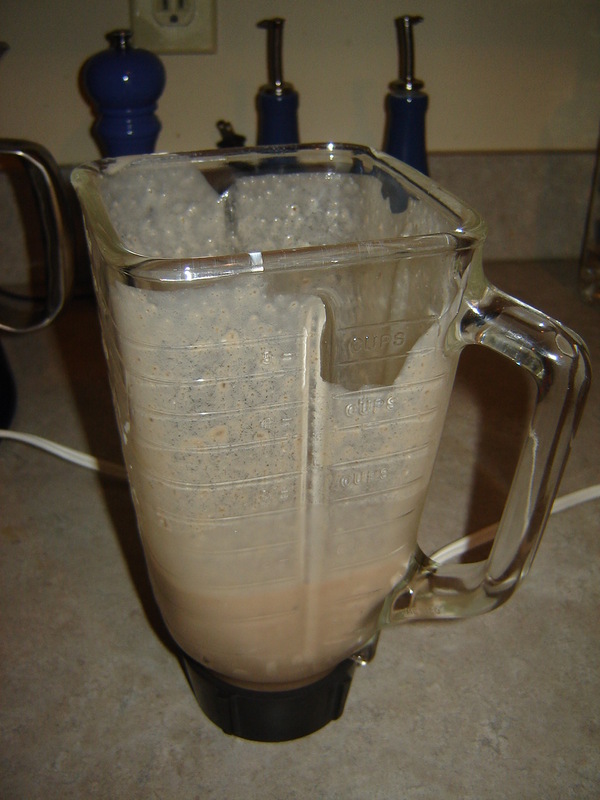 Put all ingredients in blender and frappe on high for 2 minutes. Makes enough for one smoothie. 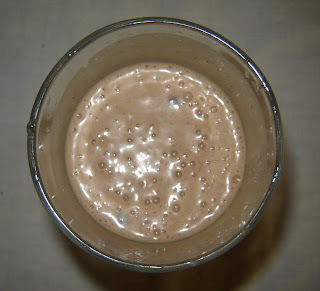 Future post will explain the little black flecks in the smoothie. This past weekend in NY and much of New England was unseasonably warm. It felt like August. I did not want to cook or really do anything to add heat into the apartment. And again with the banana, hot humid air only makes them ripen faster. One of the ways I try to use bananas when they are just past when I would like to eat them is put them in the blender. Once they are all mushed up it really doesn't matter to me how ripe they are. Thus, my next few post will be of some smoothies I make when it is just too hot to cook. The first is a new one that I just started making. My no fun name for it is simply what it is...Chocolate, peanut butter, and bananas. Put all ingredients into blender at once and blend on high for about one minute. This might take longer if you have big ice cubes and do not want any remains of ice chunks. Now I promise you that the cottage cheese taste is non-existent. I have a co-worker on a health kick recently who first told me about mixing cottage cheese into yogurt for added protein. Cottage cheese is a really good source of protein with very few calories. I would not call myself a huge fan of cottage cheese but I do tend to have it every once in a while to enjoy. You really will be satisfied with this drink for breakfast or dinner replacement due to that extra protein. I apologize for the gross pictures. Chocolate, PB, and bananas are just not colorful. Fure smoothie recipes will be a bit more colorful. Papayas!! This past week was a mad dash to get the honeymoon plans nailed down. Jordan and I had lots of hope that since we traveled so much for work that it would be very simple to plan an elaborate honeymoon itinerary in a country that spoke a language neither of us knew, at least not very well. I am happy to say we are fully booked for an amazing trip to Costa Rica. We ended up using a travel agent and thus passed off all the hard work and stress to someone else. In the middle of this process though Jordan and I started fantasizing about the wonderful exotic eats we would encounter. 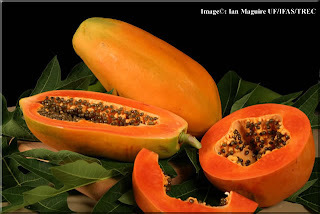 I have yet to really research this question but in the weird Asian market we sometimes frequent for fruits and veggies I spotted some papaya. We were lucky I think knowing nothing about how to pick out a good papaya with the one we got. 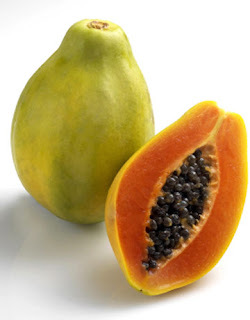 After getting back to the apartment, Jordan researched when is a papaya ripe and we realized it must change to a yellow color as seen below. Once our papaya was said color, we scraped out the seeds and just ate it like a melon. I thought it was pretty good, but very sweet. Jordan concurred. I can only begin to imagine what will find us in Costa Rica. My thoughts are as long as its pretty I will try it.